The 1972 BMW R 60 for Sale has had both front and rear tires replaced recently, battery, paint, seat, headlight nacelle, etc. 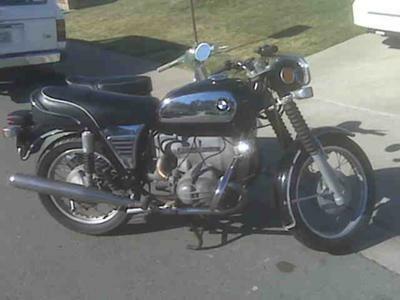 The 1972 BMW R 60 was recently gone through and updated bringing it up to very good, roadworthy condition. If you're interested in owning this vintage BMW motorcycle please call before it's gone and mention that you found my ad on GoGoCycles Used BMW Motorcycle Classifieds when you call. GoGoCycles would also encourage bikers to submit a review of the 1972 BMW R 60 for Sale to help potential buyers make informed decisions and to benefit the biker community as a whole. The bike is in Skaneateles and my price is $4200. If you want to buy the R60 or if you have questions, send me a message and don't forget to mention that you found this ad on GoGoCycle's Used BMW Motorcycles www.gogocycles.com when you call. I also own a 1972 R60/5 and am in need of a headlight assembly.If you have anything please contact me.